In previous tech, motion of shuttle or a fighter causes disturbing of pressure blood of brain. 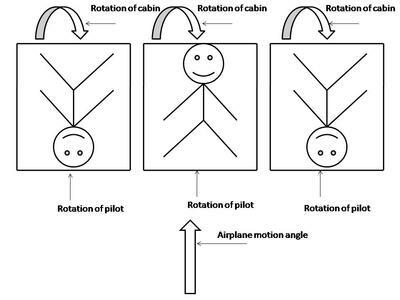 According on this tech, a cabin of aboard (passenger) will design with rotating capability. Therefore, with proportional rotations, blood in brain will be stable. Performance of this technology is same as motion of a water drop on vertical ruler. By continuous rotating of the ruler, water drop will be stable on ten centimeter. With respect and thanks for your patience. 1. This tech registered in Iran as a patent. 2. Because of the sanctions against on Iranian financial banks, when our financial and technical negotiations are done, please open a private account in western countries in the name of inventor of the invention (patent). 3. This patent is for sale.